Armenia’s highest scores came from Russia that gave it 12 points in both jury- and televoting. Bulgaria and Spain provided Armenia with the top jury scores, while Georgia gave Armenia its best televoting result. Armenia’s jury, meanwhile, gave Russia (represented by popular singer Sergey Lazarev) only 2 points, while the televoting public gave it a solid 12 points. Armenia’s top jury score went to France. Interestingly, Armenia’s jury gave no points to the eventual winner of the contest – half-Crimean Tatar, half-Armenian Jamala from Ukraine, while the country’s public gave the Ukrainian participant 10 points. Predictably, Azerbaijan overall scored the lowest in Armenia both in jury and televoting. While four of the five juries put Azerbaijan’s singer Samra in the last 25th place (countries do not vote for themselves), one jury member rated her performance as 19th overall, according to Eurovision’s official website. All five jury members in Azerbaijan as well as the televoting public gave Armenia a zilch. The two South Caucasus nations are locked in a bitter conflict over Nagorno Karabakh. Mutual animosity among the neighbors appears to have increased in the wake of the latest escalation of violence in the conflict zone in early April. Dozens of persons were persecuted in Azerbaijan by the country’s National Security Service when they sent SMS messages for Armenia in a Eurovision song contest televoting in 2009. Meanwhile, citing continuing bloodshed in Karabakh, Armenia refused to send its contestant to a Eurovision show in Baku in 2012. 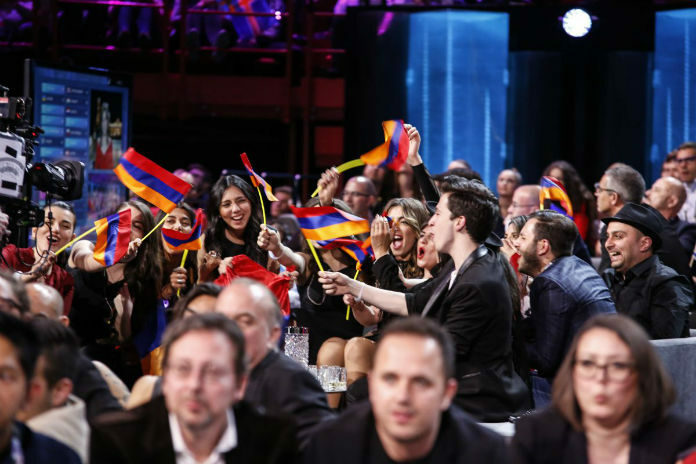 The issue of Armenia’s references to Karabakh, including flag-waving, has always sparked altercations between the two South Caucasus rivals at Eurovision shows. The latest contest in Stockholm, Sweden, was no exception.